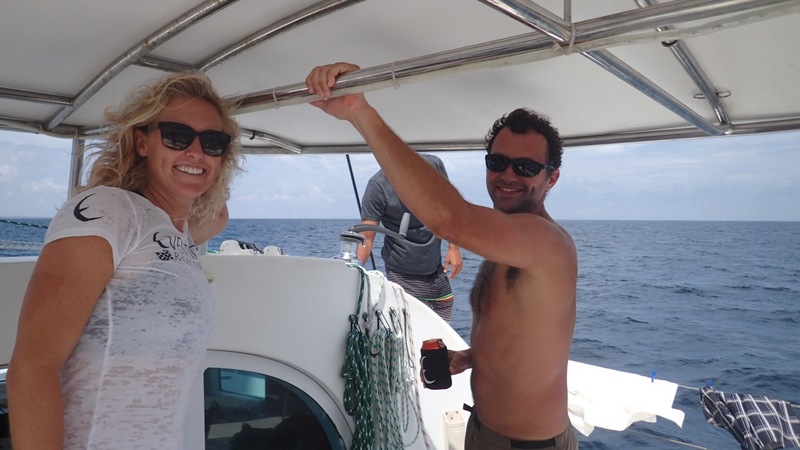 We met Todd, James, Brittany and their friend Ryan aboard Eventide a couple of days ago when they grabbed a mooring ball right beside us in the Isabela anchorage. They were young, and had a Lagoon, so it was mere seconds before Greg was chatting them up. The Denver natives were in the Galapagos on an Autografo allowing them to move their boat between three different islands. 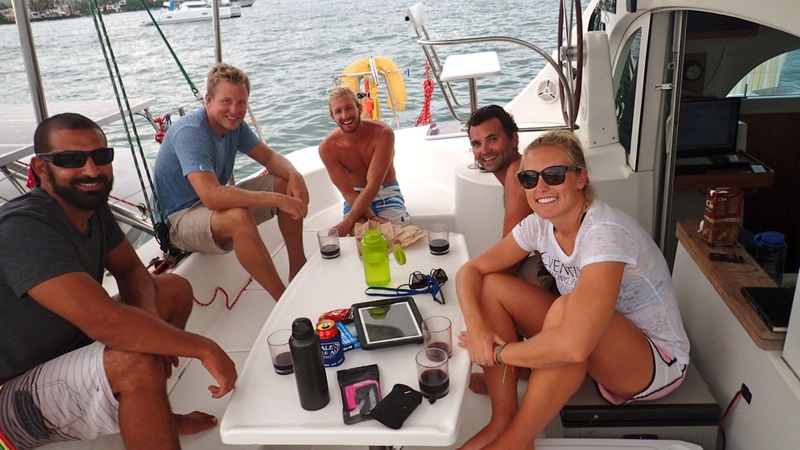 We opted to save some cash and are restricted to the single anchorage of Isla Isabela. Though we did plan to check out some different islands using the inter-island “ferries”. As luck would have it, Eventide and crew, were headed back to Santa Cruz and invited us to catch a ride with them. Super score for us! The nine-hour sail over was a blast for so many reasons. First off, getting to be the guests on a sailboat after navigating your own for so many miles is a real treat. Not a thing to worry about, not a sail to trim. Don’t let that sound like Greg wasn’t on the end of a rope at the first opportunity. As pay for our passage we had brought banana bread and beer, because if you can’t make friends with banana bread and beer you can’t make friends at all. Before we could crack into the flat though, Fit Brit busted into action and put our ragamuffin crew through one of her patented circuit workouts. Ha. No joke. There was push ups, planks, and crunches all done as a group and all done to some killer throwback beats. A regime that we’d do well to implement on our boat too, just can’t think of a zippy name for Greg or me to set it off. With sweating to the oldies out of the way cans were cracked and the cocktail cruise commenced. 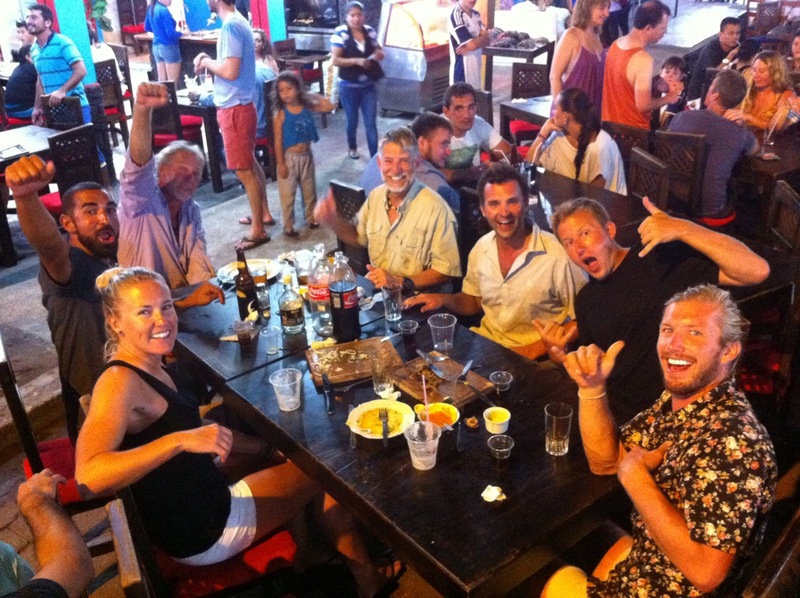 This sailing around the world business is great for seeing what’s out there, but I’m telling you, the people you meet along the way are the proverbial cherry on top. With the hook down in Santa Cruz, Greg and I grabbed a hostel before meeting back up with everyone for the evening. As we were enjoying a sidewalk cerveza, two ladies asked us to make some room for their road side shrine. An odd request, yet we gave the temporary monument its space. Minutes later it became glaringly clear why we were asked to scoot, as a throbbing mass of people came parading down the street to stop and pay their dues. 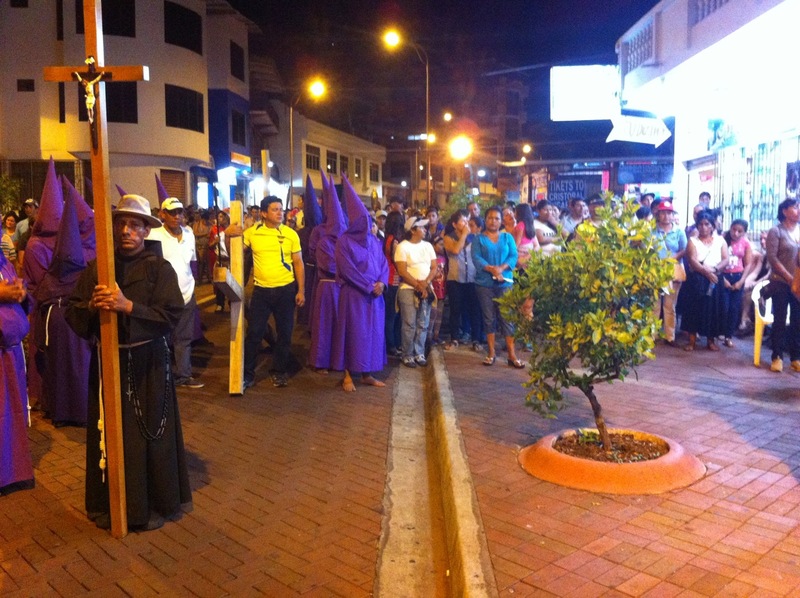 I can’t say I recognized the purple clad worshippers, or could relate to the car mounted loud speakers blasting Spanish hymns, but Jesus on the cross instantly reminded me it was Good Friday. 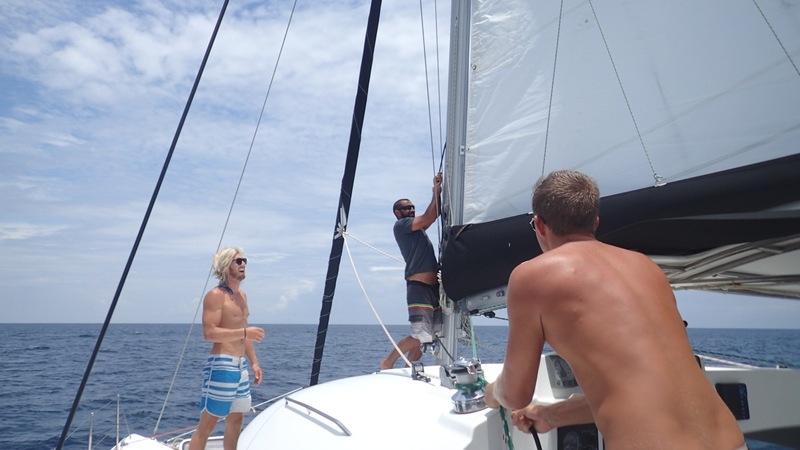 Hoisting the mainsail with James and Todd. Happy at anchor in Santa Cruz. The Good Friday parade we ended up taking in. A whiskey drenched supper with the Eventide crew and even Dave from North Carolina!